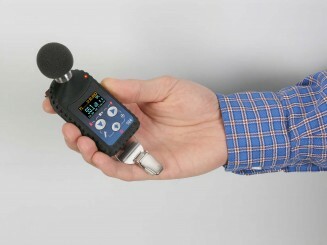 SV 104 Noise Dosimeter brings incredible functionality into a compact style instrument. The SV 104 instrument is a revolutionary new approach to occupational health and safety noise monitoring offering voice comments and audio events recording functions which are a new concept in an instrument of this size. The measurement data is safely stored in the large 8 GB memory and the amazing OLED screen displays information in both text and graphical form and offers excellent visibility even in full daylight. This personal dosimeter has a robust 1/2 MEMS microphone enabling easy calibration using most commonly available acoustic calibrators. The SV 104 is a cable-free dosimeter and is typically attached to the user’s shoulder, close to the ear using the mounting clips supplied. The instrument works with Svantek’s specialist health and safety software package, “Supervisor” and is powered using built-in rechargeable batteries or through the USB interface which also enables easy connection between the SV 104 and a PC.